If you know my modus operandi, you know I'm all about tasty and healthy meals with minimal effort. People often assume I love to cook (whatever gave them that idea ;)) but the honest truth is, I'm more driven by the end game than the process. My paramount goal has always been to feed my family simple homemade meals created from clean, whole ingredients. That's why I gravitate toward uncomplicated food. Are you anything like me? If so, this recipe is perfect for you too. It's easy because it involves only seven basic ingredients (plus salt), almost entirely done in the food processor and 25 minutes of passive cooking in the oven which is more than enough time for you to prep the lettuce and enjoy a glass of wine, for example. I used Taylor Farms' organic broccoli florets which is washed, cut and ready to be put straight into the food processor. 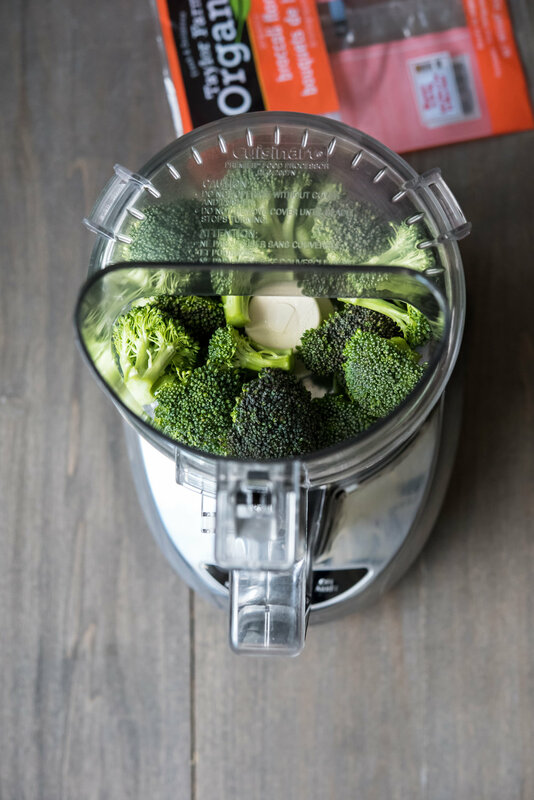 I love that it removes a couple of steps (washing and cutting the broccoli into florets) from the recipe. And broccoli is one of the 'dirty dozen' vegetables high in pesticide residue so this being certified organic is important to me. Uncomplicated doesn't mean un-delicious. This one is a definite crowd-pleaser at my house. Whip this up, devour them as we do, and then let's get out of the kitchen! Meatballs can be made in advance and frozen raw for another day. To keep their shape, first freeze the raw meatballs on parchment-lined baking sheets for a 2-3 hours or until very firm. Toss them into a freezer-safe container or a ziptop freezer bag. To cook, take them directly from the freezer (no need to defrost) and place the frozen meatballs on a parchment-lined baking sheet in a preheated 400f oven for 26-28 minutes or until the inside is thoroughly cooked (or 165f internal temperature using a meat thermometer). You can substitute with either ground pork or ground turkey instead of the ground chicken. The former tends to be slightly juicier (fattier) and the latter tends to be slightly drier (leaner) than using chicken. Negligible change in cooking temperature or cooking time (ground pork should be cooked to 160f and ground turkey to 165f according to USDA). Gluten free, dairy free, refined sugar free, egg free, paleo option. 1. Preheat oven to 400f and line a large baking sheet (or two smaller traditional sized baking sheets) with parchment paper. 2. In a food processor with the shredding disc attachment, grate 2 of the 3 carrots and the onion. Scrape out into a large mixing bowl (with at least ~5 cup capacity) and set aside. Switch out the shredding disc attachment and put in the metal chopping blade. 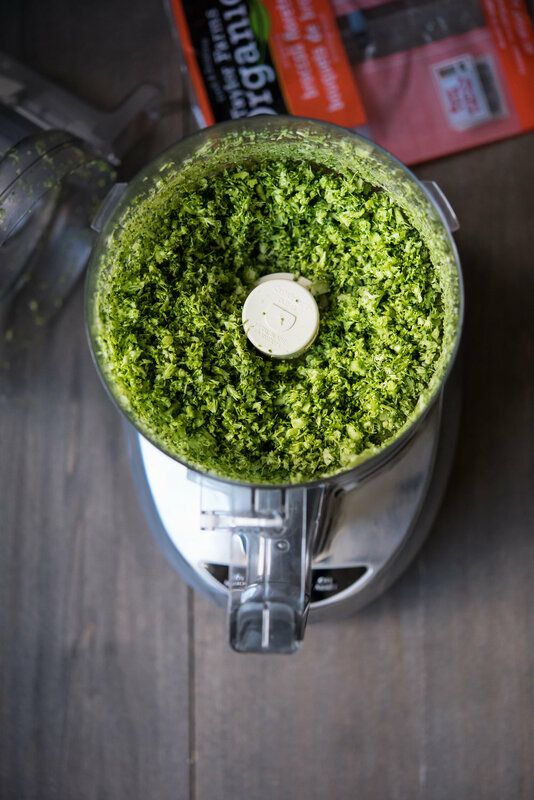 Add the broccoli florets and pulse until you have very small pieces (see image above). Add back in the grated carrots and onions, as well as the minced garlic and salt. Pulse until the vegetables are relatively uniform in size. Dump everything out into that dirty mixing bowl (see I saved you a dish and you're welcome ;)). 3. Add the ground chicken and mix very well. I like to use my hand to mix. 4. Taste! Here's the thing, it's one more step but I always encourage people to cook a small teaspoon-full of the mixture when making meatballs or fillings for dumplings or pasta. There's nothing worst than finding out too late that the entire batch is under-salted. Place about 1 teaspoon amount on a dish and microwave high ~20 seconds. Eat it and decide if you need to add additional salt, up to 1/2 tsp more (that's what I did and I use Diamond brand of kosher salt by the way). 5. Form the meat mixture into 30 balls approximately the size of a golf ball. Place them on the parchment-lined baking sheets. Leave a bit of room between them for even cooking but it doesn't require a ton of room as they shrink during cooking. If you're using hoisin sauce, brush it on the meatballs now and bake them in the preheated oven for 25 minutes, or until the meatballs are cooked through. For my daughter, I omit the hoisin sauce since I have yet to find a paleo-friendly verson (and she still absolutely loves them). 6. While the meatballs are baking, grab that last carrot. Using a vegetable peeler, run the peeler down the full length of the carrot to shave off long ribbons. These ribbons are for serving. 7. Serve the meatballs inside lettuce leaves with carrot ribbons and extra hoisin sauce if using. You can offer thinly sliced scallions and white sesame seeds as additional garnishes, if you want. This post was sponsored by Taylor Farms. All opinions are my own. Thank you for supporting the brands that enable me to create new content for this site!